Drivers are against the idea of a blanket 20mph speed limit on urban roads, according to research published today by road safety charity, Institute of Advanced Motorists (IAM). Half of drivers from the UK are against a blanket 20mph speed limit, with under a third willing to embrace the idea and a fifth are undecided. Male drivers are more likely to be against the idea than female. Fifty-five per cent of young drivers were against 20mph zones as a speed limit for towns while thirty-four per cent of older drivers were in favour. Drivers are very supportive of lower speed limits outside schools, with ninety-four per cent of respondents agreeing that this would be a good idea. Areas with high numbers of pedestrians such as parks (34 per cent), hospitals and shops were the next most popular with 21 per cent of drivers in favour. 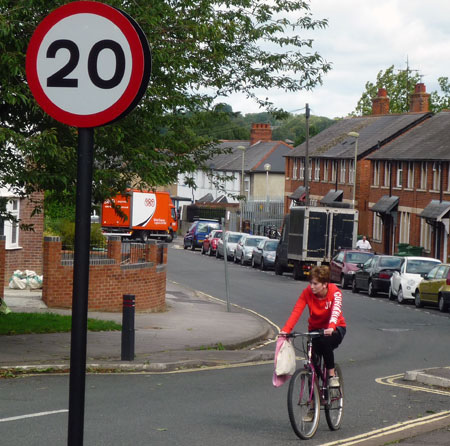 Only eight per cent of respondents opted for 20 mph near cycle lanes. Over three quarters of drivers believe that 20mph speed limits help to increase safety for pedestrians; however, only a fifth saw it as a positive advantage for cyclists. Pollution and noise were not seen as important benefits. Using 20mph speed limit signs only to enforce lower limits was twice as popular as physical traffic calming measures and three times more popular than the use of speed cameras. Only a fifth of drivers think enforcing 20 limits should be a police priority. Sixty-eight per cent of drivers would like to see a specially tailored re-education course for drivers caught doing up to 30mph in a 20mph zone. What’s your view on 20mph enforcement? Where should it apply, and how should it be enforced? Can you remember your last car journey? This entry was posted in News and Views, Reports and Surveys and tagged 20mph, 20mph zones, Institute of Advanced Motorists, road safety, Speed Limit, survey by David Petherick. Bookmark the permalink.